I sit in the chill alone, another mile further down the road, staring up at the sky and watching my breath as it forms puffs of vanishing clouds. The air is the way only winter can make it, sharp and crisp, cutting at my lungs as it goes down my throat. Clouds are gathering, distant on the horizon, foreshadowing the storm I know is coming. Wind, snow, and tumult; the storm of our humanity will not even register. I can see a fire in the distance, not far from where I crouch in the miserable shelter of a few trees. It must be no more than half a mile, if that, and I long to trudge across the snow to join whoever is there. To ask them if they will share their fire and perhaps a little food or drink, if they have any to spare. The commonwealth of all travellers on a cold winter’s night. But I do not stray from where I sit in the frigid darkness, shivering and rubbing my hands together to try to put some semblance of warmth in them. The Commonwealth—my commonwealth—died some time ago, and I have no friends left to me. Certainly not in this place. Does he feel as tired as I do? As hopeless and alone? Is he worn out and ready to quit, the strength to keep fighting drained by these endless hardships? No, not him. For him, the privations and difficulties are merely proof of his righteousness. The blood on his hands only demonstrates the justness of his cause and the lengths he will go to stand by it. For me, I do not enjoy this new world that he and his kind have wrought. That it is him, of all people, that I am forced to reckon with only makes it all the worse. If it were someone else, it would be another matter. It would not cut so deep. As these thoughts flit through my mind, I finger the tome that I carry with me. It has only the dead in it now. The incantations here that my kind once worried over are now only the words of a forgotten tongue. I am its last speaker and I have sworn myself to silence. He and his kind have seen to that. He has the silver and the gold, and our lives, so many I cannot even bear to count. And now he will take this last thing too, to bring an end to all this. I joined the Commonwealth of Sorcery when I came of age. From the earliest days that I can remember I showed signs of the gift. It came naturally, with an ease that was looked upon with both fear and jealousy by others. Within the walls of the Commonwealth, and through the rows of shelves in libraries across the territories, I did not see such expressions. I was welcomed and nurtured. I became what I am. It is strange to think about it now, for so much of what I saw then is tinged by the golden glow of summer, of a thing new and flourishing, but the seeds of the Commonwealth’s doom had already taken root. Everything that has come to pass was there to be seen, if we had chosen to see it. But we did not. In those early days I only had eyes to see Aramis. We spent as many of our hours as possible together, studying magical books and incantations, practicing spells, debating the proper use of sorcery. What constituted evil practice, and was there any sorcery that was inherently good. The sorts of things all young apprentices debate, convinced they know better than their masters. Whenever we found ourselves at our leisure, Aramis and I would wander the territories, going from library to library, bookseller to bookseller, looking for books of sorcery. There were many such texts to be found in those days, some ancient, some merely stitched together from the work of others and presented as something original. To us it was all new; we devoured everything we found, sharing it as we shared everything else. Those were my happiest days, lost to books and thoughts and sorcery and Aramis. Every memory of that time is so vivid to me, even now, as if it had just occurred a day or two before. It is a terrible trick my mind plays on me. For when I come back to myself, to this present, the chasm between then and now is made all too real. The memory I return to most often, though it pains more than any other, is when Aramis went to the city of Gos with his master. 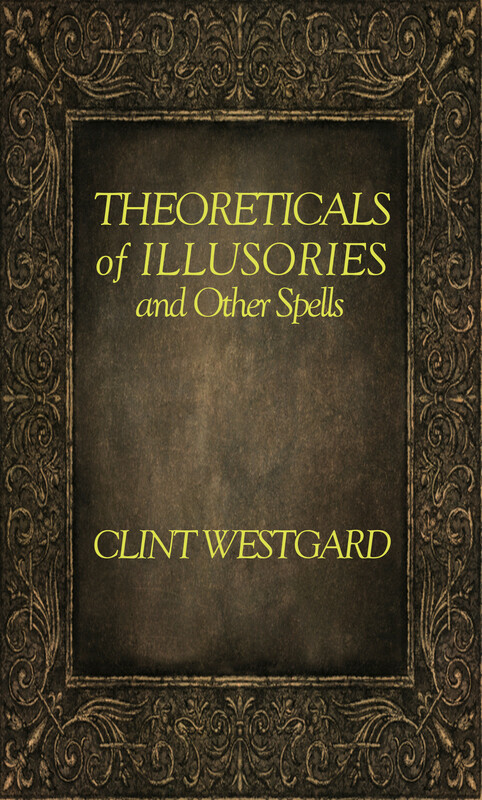 When he returned to the Commonwealth he had a book with him, Theoreticals of Illusories. Neither of us had heard of it, but it was as fine a book as I ever laid my hands upon, made with finest vellum and exquisitely illustrated. I could hardly breath when I looked at them, turning page after page, reading the words in their strange font. “It is yours,” he said. Even now, after so many years and so much that has occurred, the thought of those words still brings tears to my eyes. Then I thought that my heart was so full it could hold all my feeling within it. Now I know better what heartbreak really is.